Indonesia is one of the largest countries in the world, with a total land and sea area of almost two million square kilometres and comprising some 17,600 islands. This sprawling archipelago is also home to around 262 million people from hundreds of different ethnic and cultural groups all living in relative harmony, making it the fourth most populous country in the world, and the most populous Muslim-majority nation. Like its geographical uniqueness and diverse traditions, Indonesia—the “Emerald of the Equator”—is currently led by a notable figure who also embodies elements that may superficially appear at odds. President Joko Widodo, familiarly called Jokowi, cuts a humble and modest figure who also projects a quiet, charismatic power. He is pragmatic, populist, and an idealist, all at the same time. Truly, this is a man of the people and cultures he represents. But more than any slogan or campaign promises, Jokowi is a man of action. Entering the fifth year of his presidency and facing a general election this month, his achievements are manifold. That so much has been achieved has not just given him a strong platform from which to fight the upcoming general election but has also helped Indonesians feel a sense of national pride hat their country is respected and influential on the international political and economic stage. What Does Family Mean To Indonesian President Joko Widodo? One of Jokowi’s election promises—to finally and definitively tackle Greater Jakarta’s notoriously snarly traffic—will be among his most lasting legacies. On September 9, 2015, within his first year in office, Jokowi kicked off construction of the first part of the Light Rail Transit (LRT) network that will integrate central Jakarta with its more far-flung outskirts in the Bogor, Depok, and Bekasi areas. Furthermore, just weeks later on September 21, Jokowi inaugurated the operation of the giant drill that would pierce the bowels of the capital city in preparation for the construction of the Mass Rapid Transit (MRT) underground rail network. Next, Jokowi initiated construction of the Trans-Java Toll Road that now connects Merak, Cilegon, Banten, and Banyuwangi in East Java. Simultaneously, Jokowi also implemented his hard-work ethic in other infrastructure projects, many outside of Jakarta and even Java. For example, he initiated the Trans-Sumatera Toll Road project that connects key cities in Sumatera like Lampung, Palembang, Pekanbaru, Medan, and Aceh, as well as inaugurated the construction of a steam-electric power station in Batang, Central Java, with a capacity of 2,000 megawatts, which will be among the largest power plants in Southeast Asia. Meanwhile, in the Kalimantan region, which had suffered years of neglect, the Jokowi government has not been reluctant to siphon in Rp16 trillion (US$1.1bn) in funds for the construction of 1,692km of road. It has also overseen construction of a port that can be accessed by medium-sized ships in Papua and the development of the Trans-Papua national road project that connects the main cities in Papua with a total length of 4,331km. Further still, on the island of Sulawesi, the government developed the Trans-Sulawesi Railroad, aimed at connecting areas that have the potential of large-scale, high-speed passenger and goods transportation with low levels of energy consumption and supporting integrated urban development. The construction of this railroad line began in 2015, targeting a 2,000km distance stretching from Makassar in South Sulawesi to Manado in North Sulawesi. Why does infrastructure matter so much to Jokowi? For those without an inclination towards the study of geopolitics, it can be hard to imagine the sheer size of this great nation as well as its cultural diversity—reliable and robust infrastructure is imperative to building connectivity between cities, regions, provinces, cultures, and people. By focusing on developing infrastructure, Indonesia, rich in human as well as natural resources, begins to function like a complex organism, with each area and culture connected to and feeding the others. Infrastructure also acts as a great redistributor of wealth so that dreams of equality for all levels of society can be realised. “This is not just a matter of economy—but also creating social justice for all Indonesian citizens,” President Joko Widodo explained on harianmerdeka.com on February 13. Looking back over more than four years of a what is unarguably a successful presidency, the Jokowi government has ticked off much of its extensive to-do list already: it has built more than 20 dams; it has built around 3,400km of ordinary roads and 443km of toll roads; it has accelerated the construction of 15 new airports in the outer regions of Indonesia; and, back in the capital, the US$600m Terminal 3 of the city’s Soekarno-Hatta International Airport will be able to accommodate around 25 million people per year when it opens. 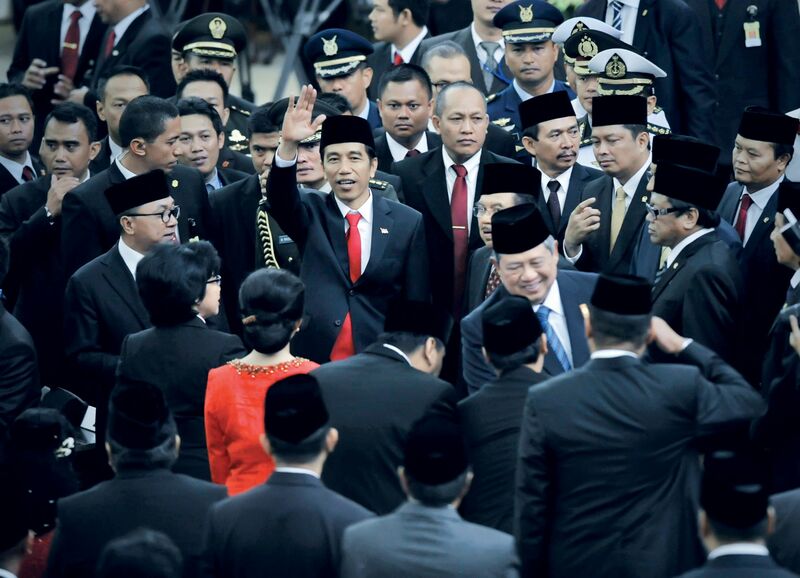 Filtering out certain political and quasi-religious white noise has meant that Jokowi has managed to instil a sense of ambitious unity in a country arguably more diverse than any other in the world. This, in turn, has led to a renewed sense of national identity, not least through the wrestling back of control of some of Indonesia’s precious natural resource assets. Oil and gas giants like Chevron, Conoco, BP, and Total have withdrawn from projects in the country, and the majority of shares in the controversial Papua-based Freeport mining operation now belong to the people of Indonesia. “This is a proof that we are sovereign. We want as much as possible natural resources to be used for prosperity and progress for the people of Indonesia,” President Joko Widodo has said, as quoted in Tribunnews on December 21. With such a far-flung population, it should also be no surprise that the Jokowi government has also focused on telecommunications infrastructure for the equal distribution of Internet access throughout Indonesia. Through the Palapa Ring national fibre-optic network development project, people in 34 provinces and 440 cities and regencies across Indonesia will soon have easy access to information, and with that, can reap the benefits of digital transactions and e-commerce. On the other hand, there is the critical view that the massive infrastructure development carried out is a waste; that it does not directly touch the needs of the people and instead adds to a large state debt. Then there is the radical religious element, the tentacles of which can reach far and wide. That said, Jokowi’s dual policies of enforcement and prevention have thus far seen only one major security incident. This, the bombing and firefight near the Sarinah shopping mall in downtown Jakarta on January 14, 2016, saw eight people—including the four attackers—killed and 23 injured, and it has been suggested was perpetrated by a group with ties to a global terrorist organisation. But it was quickly condemned by the president for disturbing the peace and spreading “terror among our people”. Meanwhile, at the 2018 Asian Games in last year, the opening ceremony saw President Jokowi apparently weaving in and out of traffic on a motorcycle and into the venue, wowing a regional audience numbering in the millions. Later, in October, the 2018 Annual Meetings of the International Monetary Fund and the World Bank Group took place in Bali. The world’s eyes were, all of a sudden, focused on Indonesia. One notable achievement in shifting the position of the country into the front-and-centre is the fact that Jokowi himself has become more of a celebrity politician than the country has seen in generations, albeit one at odds with Western leaders for whom the term “populist” is now arguably derogatory. Jokowi is listed among the World’s 500 Most Influential Muslims and in the top-50 list of The Royal Islamic Strategic Studies Centre based in Amman, Jordan, ranked at 16th and side-by-side with Turkish President Recep Tayyip Erdo an and Saudi King Salman bin Abdulaziz al-Saud. No wonder his waxwork in Madame Tussauds Hong Kong collection has become Indonesia’s second figure after the republic’s founder, President Soekarno. However, all this doesn’t mean that everything is flawless. There are several infrastructure projects that remain to be completed. There are also a few reports of damaged toll road foundations at recently opened projects. Meanwhile, Jokowi’s detractors say that the infrastructure investment is a waste of valuable resources that could instead directly benefit the people and the country rather than adding to state debt. But it cannot be denied that the majority view is one of success. Ultimately, politicians can be judged on their achievements, and as Indonesia moves into election mode once again, the hope among his supporters is that Jokowi’s considerable actions speak more loudly than his carefully chosen and softly spoken words, which can sometimes be drowned out by more belligerent voices. Jokowi also didn’t spring from nowhere. This working-class fan of Metallica and motorcycles honed his can-do skills as the mayor of Surakarta and governor of Jakarta, even being listed by the Washington Post Company’s Foreign Policy magazine as one of the Leading Global Thinkers of 2013, itself citing his third-place ranking in the World’s Mayor Prize. He hails from a modest background, in touch with the needs and will of the people. Jokowi also has the quiet authority of a family man, totally at ease with himself and seemingly unburdened by the weight his office carries. This is a man who has achieved results, although—like a giant supertanker—changing the direction that Indonesia moves in can be painfully slow. The election later this month will see to what extent Jokowi’s actions and results thus far have resonated with all the people he represents, and whether he will secure a second term in office. This article first appeared on Indonesia Tatler.